Comprehensive review of Nivea Sun-Kissed Radiant Skin Gradual Tanner. See what real experts have to say about this self tanning product. Nivea Sun-Kissed is a gradual tanner and daily moisturizer. It’s cheap price is the most enticing aspect of this self tanner. For those who are looking for a subtle glow that develops throughout the week, then this product might be okay for you. But, if you’re looking for a self tanner that makes you look like you spent the weekend in the Bahamas, Nivea Sun-Kissed is NOT for you. Its affordable price isn’t the only thing we liked about Nivea Sun-Kissed. The smell of the lotion pre-application is actually quite lovely. It applies smooth and even onto your skin and doesn’t leave your hands with left over color in the creases (I hate when that happens). I would recommend this product to my Grandmother, and her friends who can’t spend long periods of time in the sun but want a little bit of color during the summer. However, the smell of the lotion begins to turn from lovely into a not-so-lovely DHA odor over time. The color is not instant, in fact it takes a full 5 days of application to notice any significant change in color. Nivea Sun-Kissed, for the most part, works how it says it does. A gradual tanner that builds to a subtle tan at its max strength on the fifth day of application. But, the color on the fifth day was disappointing, especially when you don’t have 5 days to wait for results. Nivea Sun-Kissed Radiant Skin Gradual Tanner is a light brown colored lotion. It rubs in very evenly and a little goes a long way. Nivea Sun-Kissed instructions are to apply liberally, evenly smoothing onto your skin. In 5 days the color will reach its maximum potential (which isn’t very dark with this product). 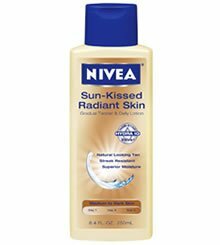 I put Nivea Sun-Kissed on every day after I showered for 5 days. There is no guide or noticeable color change when applying the lotion. It did not leave any brown tanning in the creases of my hands either. There is a little glitter in the lotion (not much) that leaves the impression of a natural glow. Nivea Sun-Kissed dries like any other lotion. After rubbing the self tanner in, my skin felt damp for about 5 minutes. Within 10 minutes I felt it safe to put clothes on. Pre-application (right out of the bottle) Nivea Sun-Kissed smells really good. It has a citrus smell with a hint of vanilla and coconut. I really enjoyed the smell this self tanner gave off for the next 6 hours after application. After I showered, however, the smell was gone. But, then it started all over again because you have to use it every day…. I felt like I was in the movie Groundhog Day. There is no initial color change when first applying Nivea Sun-Kissed. In fact, it wasn’t until about the third day of applying the lotion that I actually saw any difference in my skin color. There’s a shimmer/sparkle that is subtle in the lotion which gives your skin the “natural glow” look. Nivea Sun-Kissed is meant to be applied every single day and take the place of your daily moisturizer. If you follow the instructions of daily application then your “natural glow” will last as long as your bottle does. If you are inconsistent with the product then you won’t see any real changes in color, especially after you shower. I wouldn’t recommend Nivea Sun-Kissed Radiant Skin Gradual Tanner for men. The pre-application smell is a bit girly at first until the DHA smell takes over (and that doesn’t smell good on anyone, I don’t care how cute you are). $9.00 for an 8.4 0z bottle. So it will cost you about $1.07 per ounce. This is one of the cheaper self tanning products that we’ve reviewed. However, because this product is to be applied every single day, it won’t last you as long as instant as other, higher quality self tanning lotions. Price $9 or $1.07 per ounce, very inexpensive!